We found two very interesting Google searches made on the stolen Mac computer that was seized from Hollywood Hills Burglar Bunch suspect Nick Prugo -- and they both have to do with the probability of getting busted for using a stolen comp. 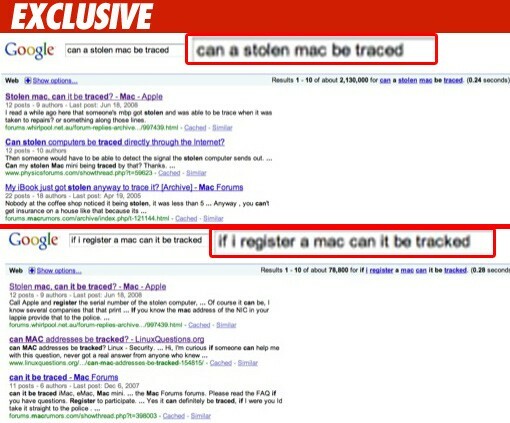 The Google searches were made for "can a stolen mac be traced" and "if i register a mac can it be tracked" -- an ironic use of precaution after security camera videos from both Audrina Patridge and Lindsay Lohan's houses showed that the alleged burglars weren't even wearing masks. As we've previously reported, the computer was full of searches for the addresses of a number of celebrities whose houses were burglarized and photographs of jewelry worn by those celebs. Burglar Bunch to Lindsay: Watch This!